the better the food on the table. The animal feed should be perfectly adapted to the specific type of livestock and their stage in live. This challenges the nutritionist to formulate recipes that make sure the final feed compound contains all the right nutrients in the desired quantities to allow it to be an easy digestible feed with an optimal feed conversion rate. Feed millers are challenged to optimally process a large number of ingredients and ensure the desired feed quality while keeping capacity high and animal feed costs low. We can help you to find that balance between feed quality and feed costs. With the input of your requirements and our engineering expertise and process know-how we are able to build your feed mill in a configuration that will give you a competitive edge. The cleaning of raw materials ensures a problem-free total process and a high-quality semi-finished or end product. The perfect end product and the most economical production method are dependent on the right dosage. Precise harmonization of the components demands a high level of dosing and weighing accuracy. Grinding or particle-size reduction is a major function of feed manufacturing. In the mixers a wide range of raw materials, additives and liquids are mixed into a homogeneous animal feed mixture. The meal is heat treated by the addition of steam in the conditioner before entering the pellet mill. In the pellet mill the hot meal is transformed into feed pellets. Animal feed pellets can be produced in several diameters and hardness’s. The pellets will be cooled in a counter flow cooler. During crumbling pellets are reduced to crumbs. The size of the crumbs is adapted to the need of the animal and the feeding system. Sieving may take place at the beginning of the process and after pelleting and crumbling:Sieving of raw materials is intended to separate sizes. Smaller sizes do not need to be grinded. By sieving the raw materials first the grinding process is optimized and energy can be saved.By sieving pellets and crumbles fines are sorted out, improving the quality of the end product. The fines itself are returned into the process preventing waste of raw materials. Depending on the product, post pellet liquid addition can be applied. Our coaters are designed to add fats and soluble additives such as enzymes and probiotics on animal feed pellets. Low-contamination, horizontal or vertical transportation of semi-finished or finished products within the factory. 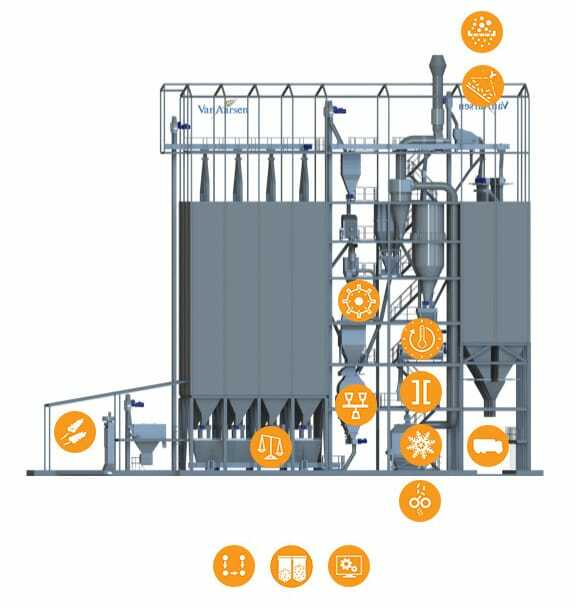 To achieve maximum performance of your feed mill, feed mill automation helps you to control and optimise the complete production process.